The following is an excerpt from our white paper, Tips to Raise the Strategic Profile of Your Information Center. Get your copy here. For information professionals looking to demonstrate the value of your information center, it’s not enough to simply provide content and expect the organization to know how and where to access it. Exposing new tools and resources to a wide range of potential users across the company is necessary not only to maximize the value of content, but also to gain information services advocates. How do we find new users? How do we demonstrate the value of these new tools? Our idea for a robust and flexible training plan evolved into a training strategy for the Scientific Information function. The plan and strategy consisted of core trainings that would develop the competencies of all users, ranging from beginner, intermediate and expert level sessions. These progressive trainings ensured users could improve their confidence in using the platform and become strong advocates for it. We made a training calendar accessible to all employees within the organization, which allowed interested users to register for a training and automatically be placed into a training session. In addition, we worked proactively to identify any cases where additional training would be beneficial, and worked to create custom training on a one-to-one basis to ensure they had the correct levels of support. To support these core training offerings, we produced newsletters which we sent to the organization via distribution lists. These email newsletters increased visibility of the training sessions and provided information regarding product updates, prompting further interest. Doing this somewhat exploratory work demonstrated the interest in the tool worldwide, and demonstrated improved visibility for our tools, and the work of the wider Scientific Information team, causing the scale up of sessions worldwide to support RightFind in becoming a globally-used resource. As a response to the core training offering, we monitored usage to determine a potential correlation between user training and use. We saw usage had increased 2% month-over-month across all teams across the organization. So, to further maximize the impact of the training sessions, we utilized RightFind Business Intelligence data to determine which teams across the organization were increasing in volume of use, and which others were emerging users. This data allowed us to successfully identify those teams, areas and groups that needed further training and support. 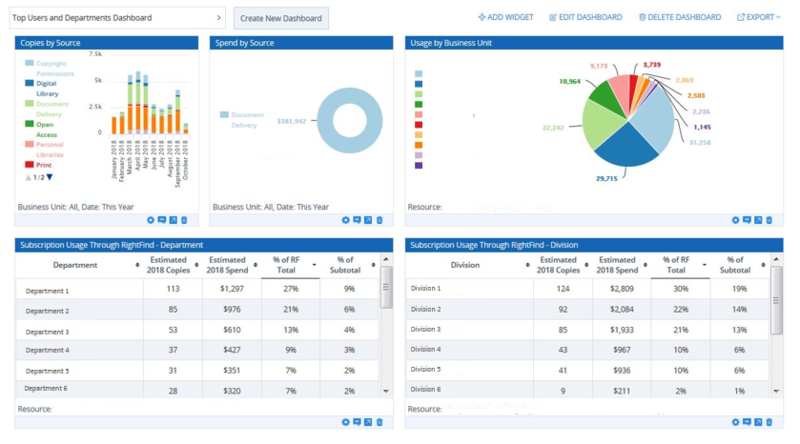 This is a mock example of a RightFind Business Intelligence dashboard that showcases top users and departments. How do we know this training has been a success? To date, the user training and support strategy has spanned 2,500 employees across 35 countries as culturally diverse as India, Brazil, China and Australia, and continues to support the content ROI across the organization. In this respect, the Scientific Information function is continuing to lead the way in training efforts and reaching out to end users. What is Value Data and Why Do Information Managers Need It? John Boon is a Senior Information Specialist, responsible for managing the global content portfolio and extensive user education and outreach program within biopharmaceutical company UCB. He has worked as part of UCB’s Scientific Information and Intelligence (SII) Team for five years and throughout that time has worked to develop a growing global network of active users for the RightFind platform and to increase the global footprint of the SII team. Prior to this, John has held roles managing academic, law and public libraries and developed new strategies of working for each sector. In his academic career, John has spanned numerous disciplines, from achieving a M.A. in English to a M.Phil in Information Management at University of the West of England, Bristol.